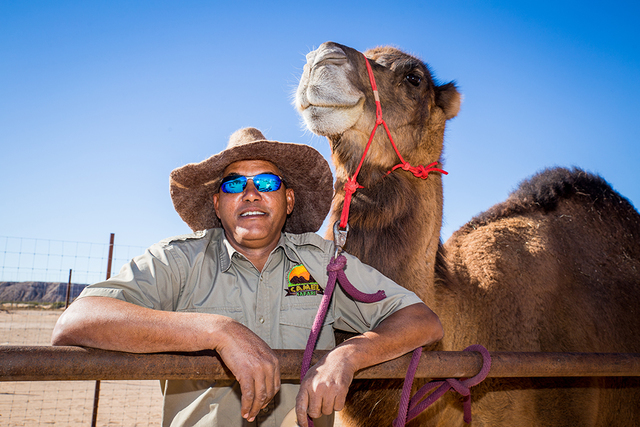 Guy Seeklus, who owns 176 acres along the Virgin River, offers riders a chance to take a camel down a 2-mile trek, for about 30 minutes, on one of his camels — Lodi, Ben, Raider just to name a few. Some of them stand over 7 feet tall, from ground to the top of the hump. The cost for all this entertainment is $149. This price includes a lift from the Eureka Casino in Mesquite or anywhere on the Strip in one of two Mercedes-Benz Sprinter vans Seeklus owns. 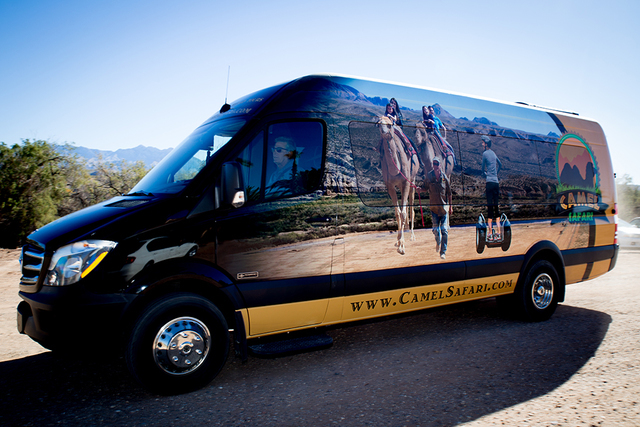 TONYA HARVEY/LAS VEGAS BUSINESS PRESS Camel Safari will transport guests to the 176-acre Bunkerville attraction in Mercedes-Benz Sprinter vans like this one. TONYA HARVEY/LAS VEGAS BUSINESS PRESS Camel Safari owner Guy Seeklus has a herd of 14 camels in Nevada and 15 back at his Washington farm. Also, there are three expecting mothers. Sidi Amar, a native Tuareg is the attraction's camel trainer. 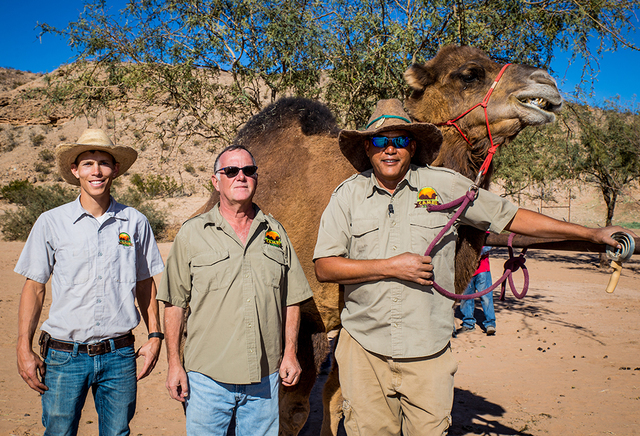 From left, Colton Teerlink, manager at Camel Safari; Guy Seeklus, owner; and Sidi Amar, camel trainer run the new Bunkervile attraction. TONYA HARVEY/LAS VEGAS BUSINESS PRESS Some of the camels are 7 feet tall. A long, winding dirt path, a set of Keep Out signs, with one offering a final warning to turn back, seems a strange welcome party at the front entrance for a new tourist attraction. 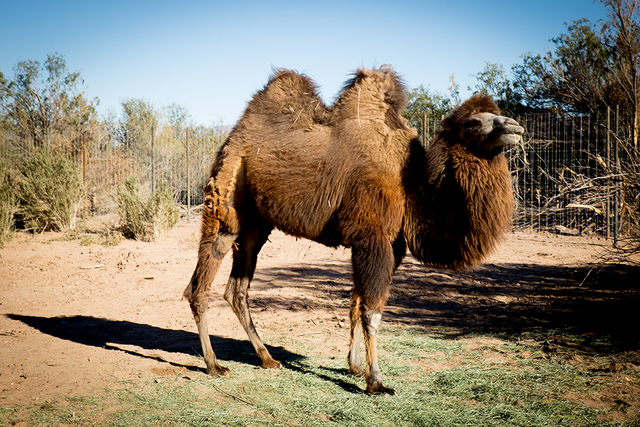 But that’s what travelers looking to spend the afternoon riding a one- or two-hump transport at Camel Safari in Bunkerville, a rural town about 75 miles north of Las Vegas, will encounter on their journey. For the adventurous types who find their way to the farm, should they decide to drive themselves, a group of baby camels can be spotted to the left when they first pull in. And maybe a few others from the herd that are ready for riding. Guy Seeklus, who owns 176 acres along the Virgin River, offers riders a chance to take a 2-mile trek for about 30 minutes on one of his camels — Lodi, Ben, Raider just to name a few. Some of them stand over 7 feet tall from the ground to the top of the hump. The cost for all this entertainment is $149, which includes a lift from the Eureka Casino in Mesquite or anywhere on the Strip in one of two Mercedes-Benz Sprinter vans Seeklus owns. But the total adventure doesn’t just include a short ride. Visitors first get an educational session on camels, which includes a history lesson on their evolution, and then get a chance to pet some of the baby camels Seeklus has on the farm: Bessie and Fabio are a couple. 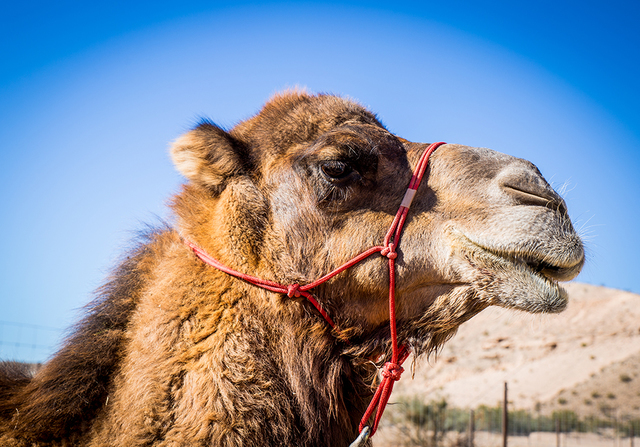 A lower-cost tour includes just a history lesson and a chance to pet and visit the baby camels. This, however, doesn’t come with a free run to Mesquite. The cost is $40 for adults and $20 for children under 12. Seeklus said his story began in 2007 after he bought a ranch in Bellingham, Washington. He is originally from Vancouver, British Columbia. Seeklus purchased a camel for the fun of it, he said. Of course, his new friend needed a mate. That’s when he picked up Norman, who now has a place to sprawl out on his Bunkerville ranch. In Washington, Seeklus said, he had an office at his home. His background is in marketing, and he owns an online background check company, he said. Clients would come by once and a while and ask about riding the camels. There seemed to be a lot of interest at that time, Seeklus said. Being in marketing by trade — Seeklus has an MBA from the University of Western Ontario — he noticed an interest and jumped at it. He bought two larger camels for people to ride. As time went on, Seeklus bought more and more camels. Today, he has a herd of 14 in Nevada and 15 back at his Washington farm. Also, there are three expecting mothers. The Nevada herd contains a mix of two-humped Bactrian camels and one-humped dromedaries on the farm. Seeklus also has a hybrid of the two. During the educational piece, Seeklus talks about the history of the camel. Interestingly, the camel first roamed in North America — and in the Nevada desert. Seeklus said there are still fossils on parts of his acerage. But the herds moved on to other parts of the world after the last ice age, the Pleistocene Epoch. The herds moved toward East and Central Asia and parts of South America along with Iran and Arabia. Today, the domesticated camel can also be found in several parts of the world, including Asia and Africa. Seeklus’ Bactrian camel is from Central and East Asia. The dromedary can be found in parts of North Africa and southwestern Asia and has been introduced to Australia. But there are breeders closer to homes where camels can be found. Colton Teerlink, who manages Camel Safari, said there are several breeders, mostly in the West, the South and Mexico. “If it’s a full-grown rider, they can be around $15,000 or so,” Teerlink said. And for a female Bactrian, that could run about $20,000, he said. 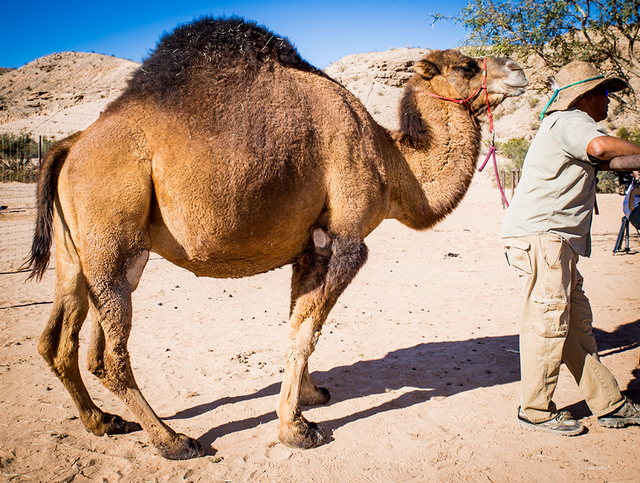 Seeklus also employs Sidi Amar, a native Tuareg camel trainer. Seeklus, whose Nevada farm neighbors Cliven Bundy’s ranch, said his camels are enjoying their new home. And the neighbors have been great, he said. The ranching family’s feud with the federal government has made global headlines in the last few years. They are well-known for the 2014 standoff with the Bureau of Land Management over a cattle grazing dispute, and this fall, Bundy’s sons Ammon and Ryan were exonerated of charges in connection with the armed occupation of the Malheur National Wildlife Refuge in Oregon early this year. “These guys love it,” Seeklus said. Seeklus said he plans on retiring in Nevada, just him and his herd. As far as business, Seeklus said he’s expecting things to get busier with his grand opening celebration in November. He said he has also partnered with Allegiant Airlines and is getting a spot on Expedia as well. Seeklus said he plans on keeping some of the herd on his Washington farm. That’s where he plans on keeping his dairy farm selling camel’s milk. “The camel’s milk is very pricey … and demand wildly outstrips supply,” he said. A quick search on Amazon.com shows six 16-ounce bottles of raw camel milk cost about $100 or more.